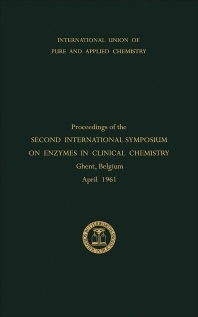 Enzymes in Clinical Chemistry presents the proceedings of the Second International Symposium on Enzymes in Clinical Chemistry, held in Ghent, Belgium, on April 14–16, 1961. This book provides information pertinent to the application of enzymes in clinical chemistry. Organized into 16 chapters, this compilation of papers begins with an overview of the alterations to serum and plasma enzymes that represent subtle protein modifications associated with disease states. This text then provides a comparison of the Michaelis constants of particular tissue alkaline phophotases with those of serum alkaline phosphotase from several pathological states. Other chapters consider the origin of metabolic changes in leucocytes, including the genetic metabolic defects, the intrinsic disturbances arising in leucocytes themselves, and the blood metabolite or hormone concentrations. This book discusses as well the action of amine oxidases. This book is a valuable resource for clinical chemists, chemical pathologists, enzymologists, scientists, research workers, and students.